There are 4 restaurants in this hotel .....none of them had vegetarian (eggless) options.There were Very few Indian restaurants around it. Rest it was very good. Close to many local little restaurants and markets. The size of the bedroom and bathroom is big compared to other hotels. I like the place and hotel staff’s . Excellent place to stay for me as travellers.. The hotel is comfortable, clean enough for an old hotel. Has wide space and clean bathroom. Overall, I’m satisfied with the services. The room was spacious. The team working at the concierge desk was brilliant. They were so helpful and always ready to help so was the staff at the restaurants. Loved the location in the heart of the neighborhood of Kowloon and close to great restaurants, shops, stores, parks and transportation. Staff was excellent, especially the concierge and shout out to Danny for being very nice and helpful. 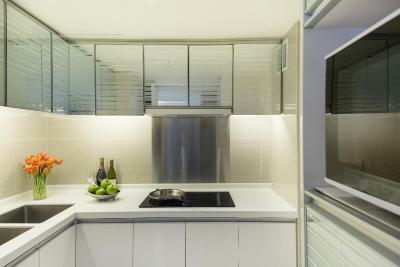 clean room, good gym and restaurant and bakery options downstairs. Everything was just perfect. Spacious rooms and bathroom. And super convenient transportation, has got two bus stops, one just in front of the hotel and another one three minutes away. Regal Oriental Hotel This rating is a reflection of how the property compares to the industry standard when it comes to price, facilities and services available. It's based on a self-evaluation by the property. Use this rating to help choose your stay! 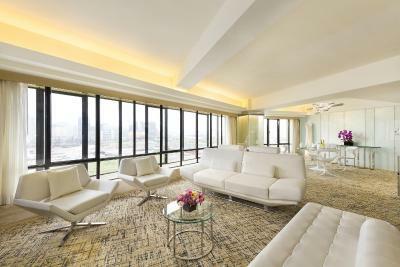 Offering beautiful views of Kowloon East and Victoria Harbor, the 4-star Regal Oriental Hotel features 5 dining options and 24-hour room service. Free Wi-Fi access is available in the entire property. 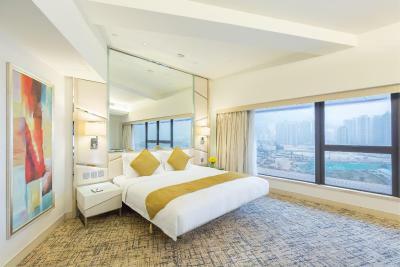 The hotel is located in the heart of Hong Kong's heritage district Kowloon City, only 1,950 feet from Kowloon Walled City Park and 0.9 mi from Wong Tai Sin Temple. 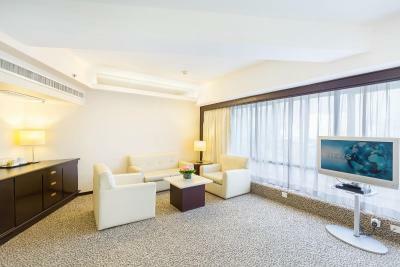 Spacious and modern air-conditioned rooms are fitted with double-glazed windows and a flat-screen TV. A personal safe included. 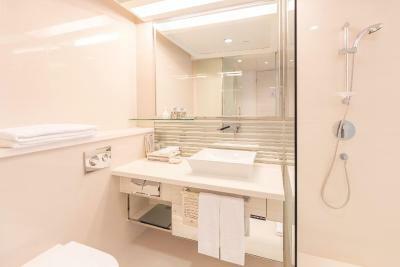 Private bathrooms are equipped with a bathtub and a hairdryer. 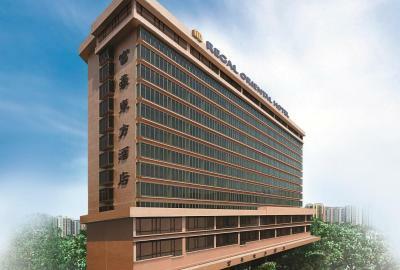 Regal Oriental Hotel is 15-minute drive from Mong Kok Ladies' Market and less than 3.1 mi from Avenue of Stars. The hotel's shuttle bus takes guests to Airport Express Kowloon Station and MTR Hung Hom Station, at an extra charge. There is also a minibus service outside the lobby to bring guests to Mong Kok. The fitness center on the 3rd floor is well-equipped with weights, treadmills and cardio machines. 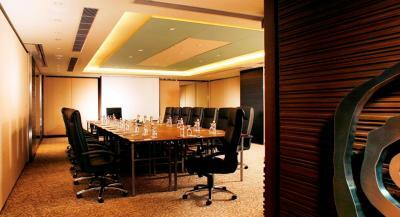 The hotel also provides a business center and full banquet facilities. Self-served laundry facilities are available with additional charges. 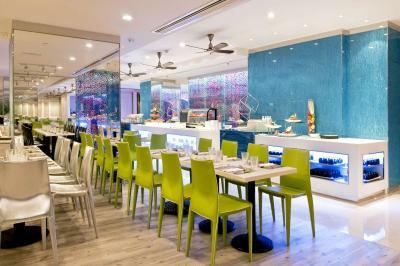 Café Neo offers both Asian and Western fare featuring Hong Kong favorites with delightful surprises. 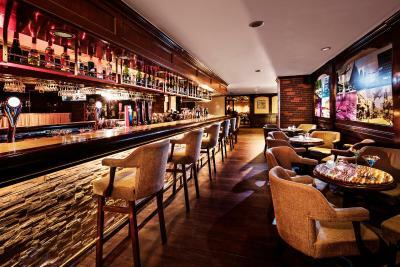 China Coast Pub + Restaurant specializes in a wide selection of burgers complimented by classic American sized dishes. The Chinese restaurant is renowned for its Cantonese culinary. 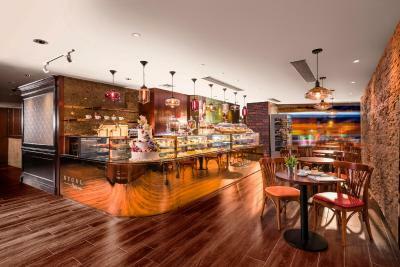 The Regal Patisserie offers a variety of homemade cakes, pastries, salad, sandwiches and bakery delights. 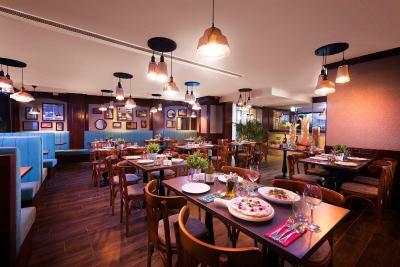 Avanti Pizzeria offers a wide array of authentic Italian culinary delights. 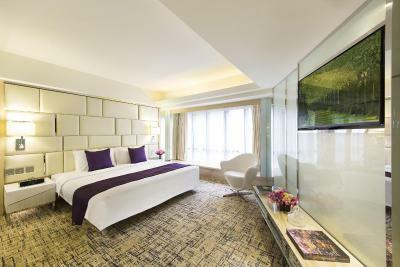 When would you like to stay at Regal Oriental Hotel? Room has a flat-screen TV with satellite channels, a mini-bar and a safe. If guest books breakfast inclusive rate, only 2 breakfasts will be provided. Additional charge will be applicable for extra adult / child. For twin rooms, the beds are 43 in wide. 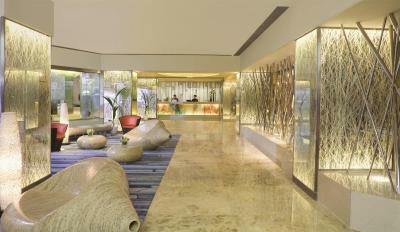 Featuring an oriental decor with warm lighting, mirrors, a flat-screen TV and ironing facilities. The room can accommodate up to 4 people (including children). 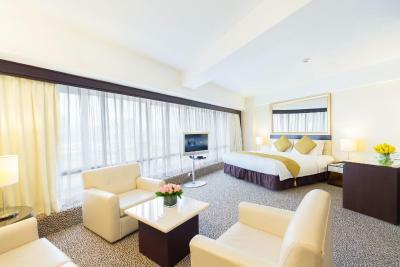 This spacious air-conditioned room features 3 single beds and double-glazed windows. The beds are 43 in wide. 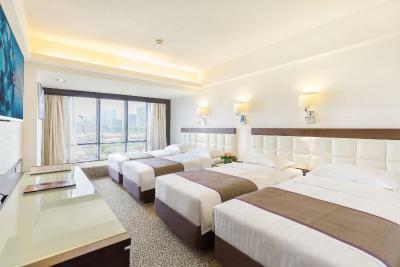 This spacious air-conditioned room features 4 single beds and double-glazed windows. Designed modern with contemporary décor and sophisticated touches, this Presidential Suite offers ultimate comfort for the discerning few. 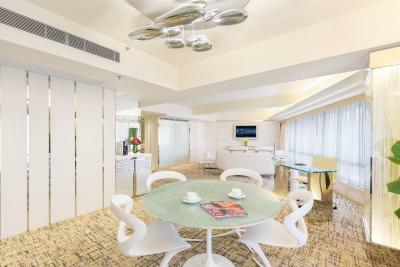 This beautifully appointed Presidential Suite has a distinct lounge and dining area, a full kitchen, a work top, flat-screen TV, independent washroom with separate bathtub and rain shower. 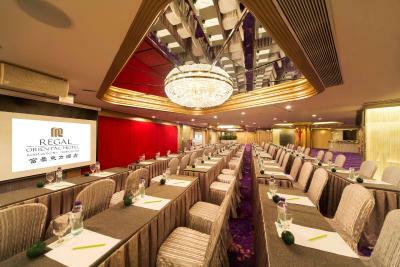 Located in Kowloon City near the fast-developing commercial districts of Kowloon Bay and Kwun Tong. The hotel is connected by major transportation networks and is surrounded by scenic and tourist spots, shopping and entertainment complexes, and themed restaurants. House Rules Regal Oriental Hotel takes special requests – add in the next step! Regal Oriental Hotel accepts these cards and reserves the right to temporarily hold an amount prior to arrival. Guests who book rooms with breakfast exclusive rates must reserve it before arrival. Contact details can be found on your booking confirmation. Please note that shuttle bus is available to Kowloon Station at an extra charge. When making the reservation, please provide the credit card holder's name in Latin alphabet. Please note that the name of the credit card holder should match the guest's name. Please note that the property does not accept bookings made by debit card. Please note that guest name change is not allowed for nonrefundable bookings. Please kindly make sure you have the right guest name during booking phase. Any type of extra bed is upon request (subject to hotel availability) and needs to be confirmed by the property. Staff extremely uncourteous. Did not do a few little things that could have made the stay far better. Very expensive food and breakfast. Front desk staffs are not helpful enough, instructions given to them, no endorsement while on break which resulted assigning same room to 2 different couples. When requested for bell boy to assist in transferring of luggage, it never came. Choices of food for buffet breakfast is few. Comfy bed, bath tub, room facilities were good. The hospitality was real bad... we had to carry or luggage to room ourselve.. no courtesy was shown by the staff to ask from my kids age 10 11 yrs to help with the bags they carrying... early check charges were levied too high... all the staff were rude even at the desk.. they think indians are fools..
Room is a bit dated and dim. Prompt housekeeping services and great location for bus stops. Old carpets in the hall way and the room (smelled of dust all the time) not ideal for asthmatics. Very polluted area due to the busy road just outside the hotel. Friendly staff, and many bus connections from the outside of the hotel. also a nice local neighbourhood. Room had damp smell. Room booked and allocated was totally different. We had booked family room with 4 single beds but was given 2 double beds. Don’t know if fault was booking system or hotel. Hotel was very busy so could not change. Convenient location for some shops and restaurants. Big rooms but little bit dated. Bathroom needs to be maintained. Fungus on the door frame. It also smelled already. We believed there will be a window and not blind glass in our room.